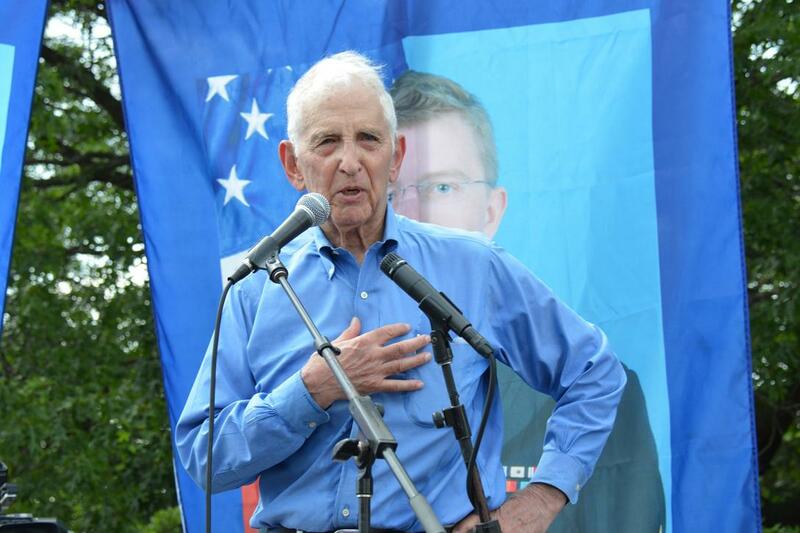 Note from the editors at WhoWhatWhy: At WhoWhatWhy, we’re proud that Dan Ellsberg [pictured left] a great patriot and American hero, has been on our Editorial Advisory Council since our earliest days. We’re also proud that we regularly feature the work and ideas of Peter Dale Scott, another figure of tremendous importance — and one whose name deserves to be a household word for his own ground-breaking studies in the dynamics of power. In 1971, Ellsberg released to the New York Times documents revealing how the US had secretly enlarged the war in Vietnam by bombing Cambodia and Laos, and with coastal raids on North Vietnam — none of which was reported in the mainstream media. And President Johnson lied about it. Here, we present a transcript of a recent talk delivered by Scott in honor of Ellsberg. I am very happy and honored to speak this evening, to this special audience of socially engaged economists, about my closest friend and mentor, Daniel Ellsberg. Though I have known Dan for forty years, I still continue to learn and appreciate new things about him. Not long ago, for example, I told him there was a Berkeley economist who thought that Dan should have won the Nobel Prize in economics, and yet this man knew nothing about Dan and the Pentagon Papers. Dan in response told me of a conference in Vienna on his dissertation, with the title “Workshop on Risk, Ambiguity, and Decisions in honor of Daniel Ellsberg.” Many of the people there, he told me, also knew nothing about the Pentagon Papers. Thus it was only by accident that I learned for the first time about the Ellsberg Paradox — something I am not going to mention further tonight, except to contrast it with another of Dan’s breakthroughs that might perhaps be called the Ellsberg Precept. By the Ellsberg Precept I mean the revelation that the timely disclosure of suppressed truth can bring about needed social change. This sounds simple, but calls in its application for great intuition, intelligence and courage. Dan has sometimes said that he should have saved lives by going public years earlier with what he knew about the Vietnam War. I disagree: I think the spectacular impacts of Dan’s revelation depended on his having waited until he could sense the country was ready to respond to it. To ignite something, you need tinder, as well as a match. It is important to recall the violence and paranoia of 1971 in America, ranging from the streets to the White House, when Dan gave the Pentagon Papers to The New York Times. By 1971, Nixon, having been elected on a promise to end the war, had instead expanded it, first into Cambodia and then Laos. In response to the Laos incursion, the Weather Underground bombed the US Capitol Building in March 1971; and in the same month a break-in at an FBI regional office exposed the FBI’s COINTELPRO programs to “neutralize or otherwise eliminate” radical movements and their leaders. By this time, Dan, obsessed by the countless lives being lost in an unwinnable war, had spent a year reading Gandhi, Thoreau, and Martin Luther King. His reflections about Gandhian satyagraha or truth-force led to this difficult, lonely, and dangerous decision: to release the Pentagon Papers to The New York Times. It was a most painful decision: In addition to the risk of 115 years in prison, he also had to accept that some of his closest intellectual friendships at RAND and in Washington would be ruptured, perhaps forever. The response to his disclosures, as we all know, was an unforgettable drama. Many prominent newspapers followed first the Times and then the Post in defying the White House, an unprecedented situation. A few weeks later, in July 1971, Nixon created the White House Plumbers; and their first action was to burgle the office of Dan’s psychiatrist Lewis Fielding, in the hopes of finding dirt to smear Dan’s reputation. Then the Fielding break-in — and subsequent government concealment of it — helped lead, in May 1973, to the dismissal of all charges in Dan’s trial, and they continued to be prominent in the Watergate scandal that led to Nixon’s resignation. In the same month of May 1973, a new, more anti-war Congress voted to end funding for combat operations in Cambodia. Three months later, in August, the cutoff was expanded to Vietnam. In other words, Dan’s revelations helped ignite, perhaps for the first time in history, a democratic cutoff to an imperialistic war; they contributed also to the unprecedented resignation of an elected U.S. president. And as an English professor, let me add a philological footnote: Wikipedia tells us that December 1971 marks the first known instance of a new noun, “whistle-blowing”. Dan was not the first whistle-blower — the same year 1971 saw Vladimir Bukowsky come forward in the Soviet Union. But the unforgettable impact of his disclosures began immediately to encourage others, mostly here but also abroad, from “Winslow Peck” (Perry Fellwock) to Edward Snowden. Some of you may not know that last fall David Sassoon, who organized the recent exposure of Exxon’s role in suppressing what it knew about climate change, wrote a letter to Dan, thanking Dan for having inspired him to undertake this important research project. 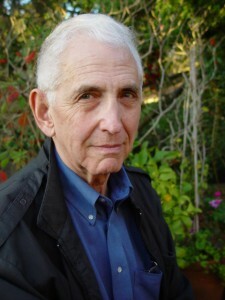 At a journalism conference in Phoenix, Daniel Ellsberg spoke to me over dinner …. He said journalists should not wait for whistleblowers to come forward — we should go looking for them. In fact we can all think of more recent whistleblowers whose courageous acts have exposed lethal corporate scandals in the energy, tobacco, automobile, and pharmaceutical industries, and such government scandals as illegal NSA spying, Abu Ghraib, and the government lies about Iraq’s uranium that were used to justify the Iraq War. Both the history and the future health of modern mega-societies have come to depend increasingly on whistle-blowers, as bureaucracies develop to a level where formal accountability is dangerously inadequate, and people of conscience must supply a human corrective. Since the ‘70s, Dan has continued to strengthen the nonviolent movement as both a researcher, activist, and impassioned speaker, perhaps the most intelligent and inspirational speaker I have ever heard. 1979 Dan sat on the railway tracks in front of a train at the notorious Rocky Flats plant manufacturing plutonium weapons parts. In 1982, to protest Soviet nuclear testing, he sailed with Greenpeace into Leningrad Harbor. Four years later, in response to US funding of the Contras, he fasted for more than two weeks on the steps of the Capitol in Washington. Through the last forty years Dan has been the principal inspiration in my personal life. With his extraordinary intelligence and intellectual curiosity, he has been a guiding light in my own thinking and writing on all manner of subjects, in both my prose and my poetry, I should add that he has been extraordinarily generous and patient in discussing and editing my writings, just as I have seen him be extraordinarily generous with others as well. With his rare combination of intellect, conscience, courage, passion, and love, I count the great privilege of knowing him to be among the greatest blessings of my life. My thanks to you, and to Jamie Galbraith in particular, for inviting me to share my gratitude with you all tonight.